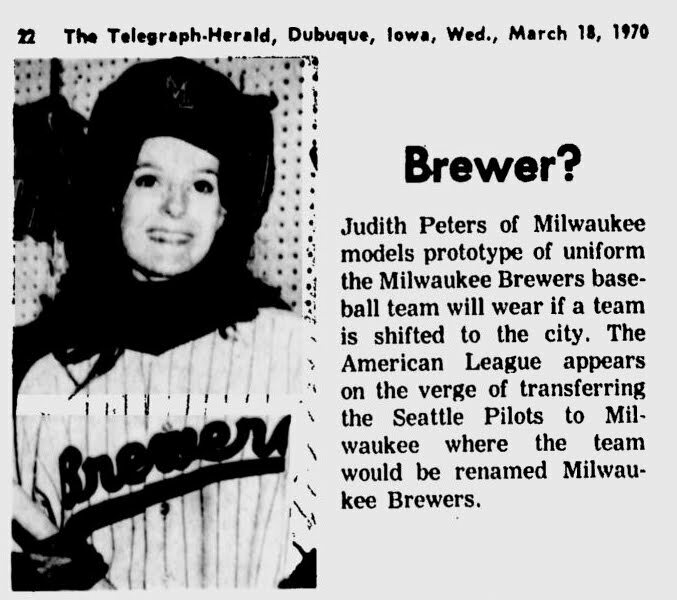 Here it is - the other American League Milwaukee Brewers prototype uniform, as seen in the Milwaukee Journal on April 1, 1970. 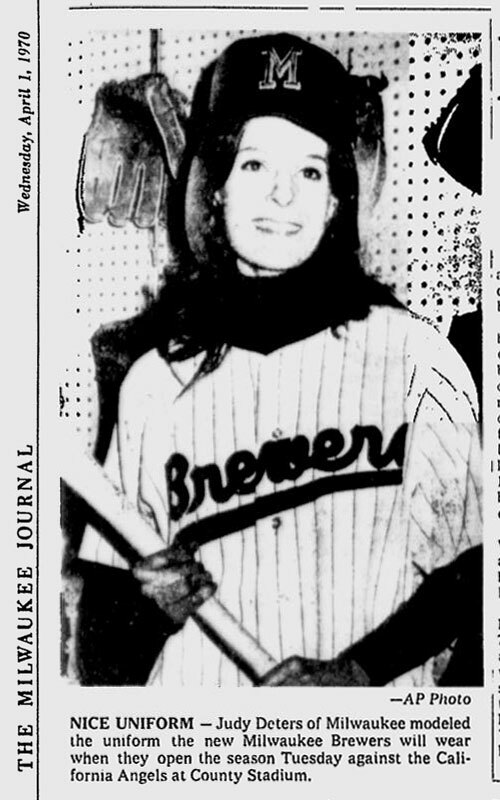 NICE UNIFORM—Judy Deters of Milwaukee modeled the uniform the new Milwaukee Brewers will wear when they open the season Tuesday against the California Angels at County Stadium. 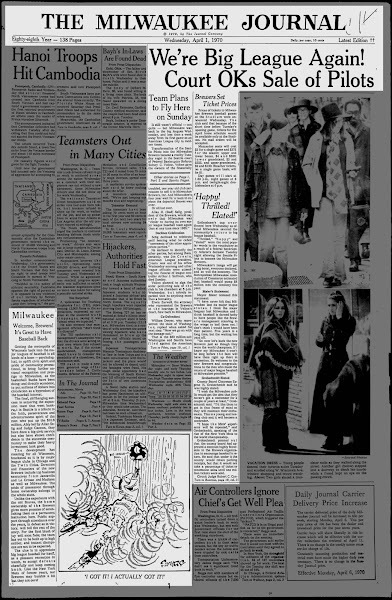 The photograph had been making the rounds for several weeks; here it is from the Dubuque Telegraph-Herald on March 18, where the model is identified as Judith Peters. Although not identified as such in the captions, it has since been reported that the jersey was navy pinstripes. The script was trimmed in navy, like the Brews wore their last few decades in the American Association. The picture was brought back by Journal on April 1st as part of the paper's coverage of the court decision allowing Bud Selig to buy and move the Seattle Pilots to Milwaukee, coverage that started under the triumphant headline "We're Big League Again!" ...a few things have just possibly been done to get ready (for the team to move to Milwuakee), but you couldn't prove it by anything anyone says officially. You could get more operational details out of a Russian submarine commander than you could out of the Brewers. Uniforms for instance. Uniforms? Um, yes. Nobody can say about uniforms. But there is a pin stripe model with a script "Brewers" on it hanging in a downtown sporting goods supply store. 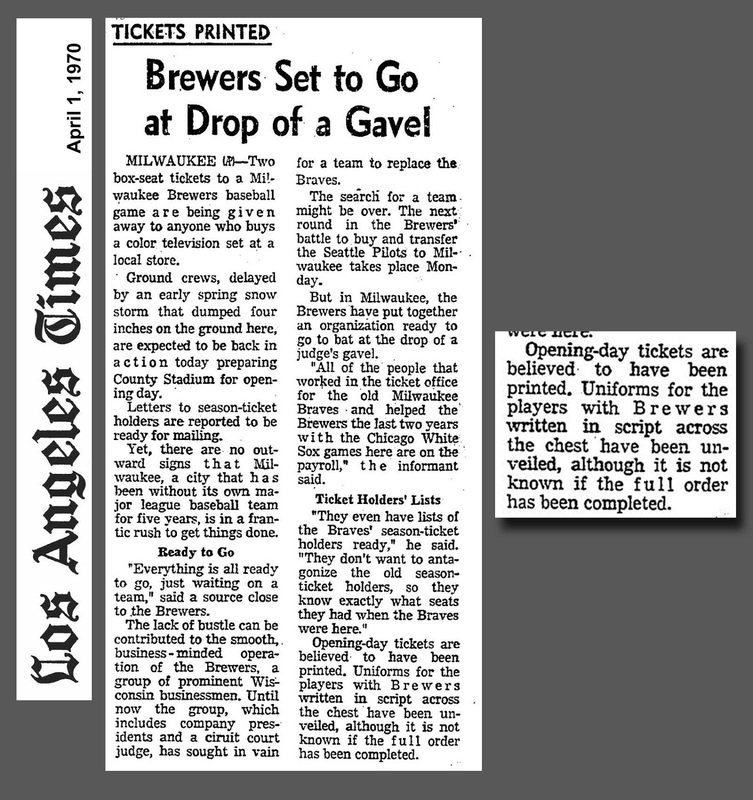 Opening-day tickets are believed to have been printed. 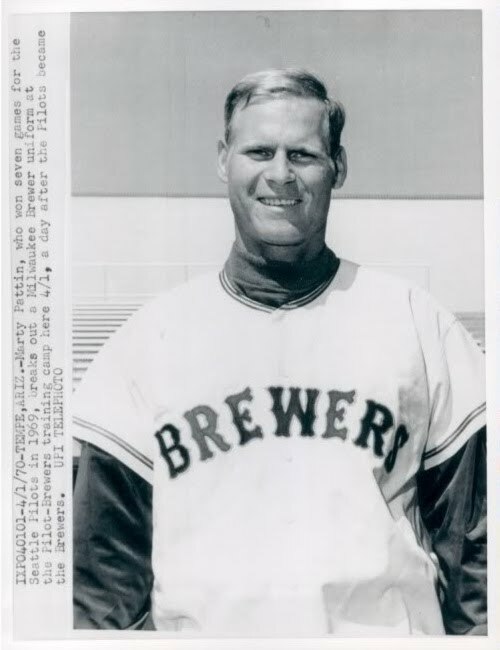 Uniforms for the players with Brewers written in script across the chest have been unveiled, although it is not known if the full order has been completed. I think it's safe to say that they hadn't, because after the decision came down the Brewers issued this peek at their proposed uniforms. Piping instead of pinstripes, and "BREWERS" in fancy block capitals instead of script. There were those who said it would be a cold day when Milwaukee got back into major league baseball, or major league baseball got back into Milwaukee. Sure enough, it was snowing when Bud Selig held his press conference at the Pfister Hotel Wednesday. 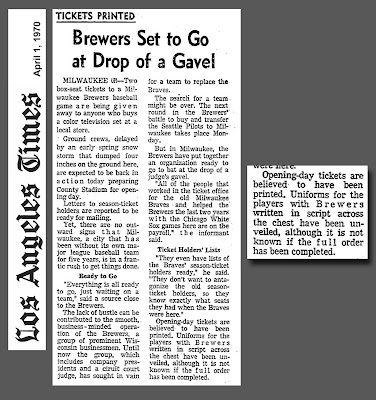 The Brewers had been trying for five years, off and on, to get a ball club, and now here they were with one and less than a week to get ready for opening day at County Stadium. As might be expected, arrangements were hectic, to say the least, but Selig came frowning through the whole thing in good style. "What about the uniforms?" he was asked. "Very simple," he said. "We just tear off the 'Pilots' and substitute 'Brewers' and we put an 'M' on the cap in place of an 'S'. Colors for the accessories are blue and gold. Well, there went the story—and the pictures—that the Brewers had new uniforms all made up and ready for the new team. It turned out that three or four pilot (if you'll excuse the expression) sets were turned out two or three years ago, just in case. "We figured if the team we got didn't have good uniforms, we'd then make our own," Selig said. Seattle's uniforms are fine, with the minor adjustments." So there you have it. The pinstripes were out. 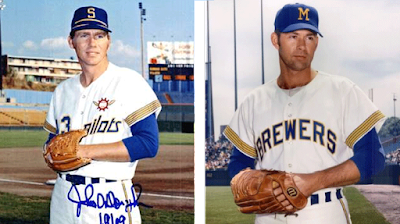 A couple minor changes to the uniforms they brought with them, and the Brewers were born. They didn't even bother to remove the Pilots' distinctive (if ugly) sleeve trim. What we don't know is why the intended fancy letters never made it onto the Brewers' jerseys. For whatever reason, they were replaced with arched block letters. 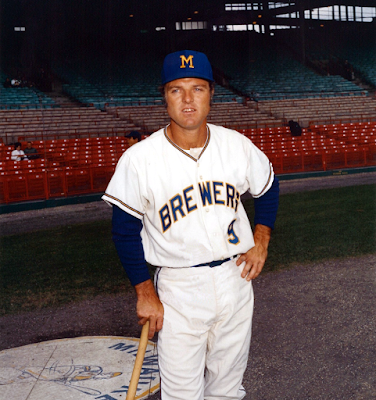 In the following seasons, when the craziness died down and the Brewers had time to make the jerseys more their own, the club modified the trim and ended up with something nearly identical to that second prototype, with piping at the neck and cuffs. The arched block letters remained, survived the 1978 overhaul, and to this day are featured on the club's alternate uniforms. So the pinstriped prototype, seen prominently displayed "in a downtown sporting goods supply store", never got beyond three or four samples, and never took the field (pinstripes, of course, would make their County Stadium debut in 1978). I wonder if any of those samples survived. Great stuff! Maybe we can get the Brewers to adopt the old-style in the near future!